The Wreck of the Icerunner is an Imperial ship which will run aground east of Solitude and north of the Abandoned Shack. 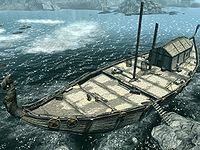 The ship was transporting passengers and cargo between Skyrim and Cyrodiil. One notable passenger was Daynas Valen, who traveled on the ship from Anvil to Solitude while researching the Legend of Gauldur. During the Lights Out! quest, the ship will be targeted by Jaree-Ra, Deeja, and their Blackblood Marauders. They will arrange for the light in the Solitude Lighthouse to be extinguished and, once the ship has run aground, they will board the ship, massacre the crew, and steal all the cargo. When you approach the shipwreck there are four Blackblood Marauders who are not aggressive unless attacked, a melee marauder and archer on the deck, and on land, one magic user and one archer marauder. The magic user will greet you, inquiring whether it was you who put out the fire in the lighthouse, and inform you that Deeja is in the hold, down two decks. By the bottom of the gangplank there is a barrel, sack, a medium coin purse, and a leveled mace. In the water between the beach and wreck, there is a dead sailor along with three visible barrels, a sunken barrel, and an empty chest. On the starboard side of the wreck there is a sunken apprentice-locked chest and two sacks, but be aware there are two slaughterfish that will attack. There are two rowboats drawn up on the beach, the first of which has three sacks and an open crate containing a leveled healing potion, a leveled stamina potion, two bottles of Nord mead, a bottle of Alto wine, and four bottles of ale. The second rowboat has four sacks, a satchel, a barrel, a medium coin purse, and a leveled war axe. On the beach near the rowboats are two barrels, one of which has a sack and two coin purses on top—one large and one small. There are also three more sacks, an apothecary's satchel, a leveled helmet, and a random variant of Imperial armor. If you enter the wreck without killing the marauders, and then proceed to clear out below deck, when you return three of them will have gone taking everything above, not in the water with them and leaving just the archer marauder and an empty rowboat behind. On the beach in and around the wreck you will find two deathbell plants, four spiky grass plants, and an iron ore vein. Everything that will disappear with the marauders is marked as owned and therefore stealing when taken. On the deck, there are two dead Imperial soldiers, one by the wheel and the other by the rear mast. There is also a dead sailor on the east (port) side of the deck. Also on the port side are three hanging, harvestable salmon and two barrels containing common food. On the west (starboard) side is a sack, a rowboat containing five sacks, a barrel, a leveled shield, a leveled one-handed weapon, a leveled warhammer, two coin purses (one medium, one large), two potions, and a novice-locked chest. Next to this rowboat are two more sacks, two barrels, and a leveled helmet. This rowboat and everything around it will also have been taken if the marauders aren't dealt with before going inside. Finally there are five barrels around the cabin. Upon entering there are seven sacks including one on a shelf of a cupboard, and an open crate containing two loose gold. Down the stairs there are two bookcases, seven more sacks, and a barrel. On your right is an open door to a bedroom containing a magic using marauder, an empty chest, a cupboard, and a table holding two common books. Following the corridor around, there is a sack, a dead sailor, an iron war axe and a cupboard with a further three sacks on its shelves. Around the corner to the left is a melee marauder sat on a bench by a closed door. This opens into the dining room, with three long tables. There are four loose coins on one of these tables. There is also a cupboard with a satchel, an iron helmet, three bottles of Nord mead and two bottles of Alto wine. Beside the cupboard is an open crate containing one bottle of Alto wine and two bottles of Nord mead. Hanging at the back of the room are two samples of dried frost mirriam, a garlic braid, and a portion of dried elves ear. Back out to the corridor and there are three more open doors on the right leading to bedrooms. There is nothing of interest in the first room. The second has a dead sailor, an Imperial light shield, a small table with a copy of the book Chance's Folly on it, an iron helmet on a bed post, a copy of the book Pirate King of the Abecean on the second bed, and an empty chest. The third bedroom has a pair of leveled boots in front of a wardrobe, an Imperial sword on the floor, and a small table with a potion of minor stamina. Outside of this bedroom is a table with an iron dagger next to a copy of Biography of Barenziah, v1. Next to this is a bookcase with a sack and eighteen common books on its shelves. Opposite the second bedroom is a closed door leading on and into a storage area. There is a Blackblood Marauder sitting behind the door at a table holding three sacks and an apothecary's satchel. In the storage area there are a total of six barrels, nineteen more sacks, a dresser, a cupboard, a knapsack, a dead Imperial soldier, an Imperial sword and shield, a cupboard, and a large and two small shelving units. Down another flight of stairs into the hold with shallow water, there are twelve sacks and nine barrels scattered about, as well as another satchel. There is another marauder over by a closed door leading to the room containing Deeja. In the room with Deeja are two empty chests, three sacks, a barrel, a leveled helmet, and a third Imperial light shield. The wreck will not exist prior to stage 125 of Lights Out!. Iron and gold ore veins can be found to the east and south-southwest of the shipwreck respectively. The wreck can exist before Lights Out! ; if visited before then, the site will be patrolled by one Imperial soldier and several mudcrabs. ? This page was last modified on 3 September 2018, at 23:18.